Eric Wilson mixes spiritual insight with modern stylings as mankind's struggle continues in the second book of the Jerusalem's Undead Trilogy. A decade earlier, Jerusalem's Undead escaped their tombs in the Field of Blood. One of their group was missing, and he will return with a vengeance, fighting his fellow Collectors for control of a vile book--a blueprint that exploits "six things, no, seven, that the Lord hates," as a way of dragging down mankind. As the Collectors vie for dominance, Gina Lazarescu finds herself fleeing through the mountains. She is alone and wounded, but more determined than ever to find and protect the children in her care. She does not know that Cal Nichols still has life-shaking secrets yet to share. She knows only that she is headed for another confrontation with the Collectors, one that will lead from Romanian castles to the Pacific Northwest and eventually to the 'Haunt of Jackals', birthplace of Judas Iscariot in Israel's arid wastelands. 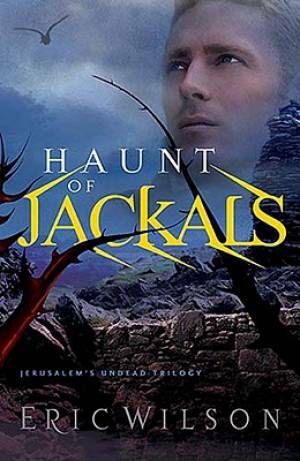 Jerusalem's Undead Trilogy #2 - Haunt Of Jackals by Eric Wilson was published by Thomas Nelson in July 2009 and is our 20604th best seller. The ISBN for Jerusalem's Undead Trilogy #2 - Haunt Of Jackals is 9781595544599. Be the first to review Jerusalem's Undead Trilogy #2 - Haunt Of Jackals! Got a question? No problem! Just click here to ask us about Jerusalem's Undead Trilogy #2 - Haunt Of Jackals.